Wagokoro Izumi edition: Cub reporter Yumemi goes to the kaiseki restaurants of Kyoto! This time I went to Wagokoro Izumi! This is the third part of my learning kaiseki series! This time I went to Wagokoro Izumi! I feel like I’m starting to understand kaiseki cuisine! 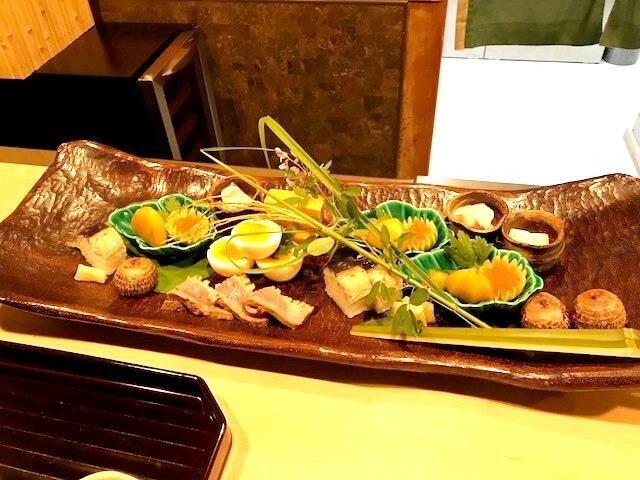 Wagokoro Izumi is a restaurant is a 5-minute walk away from both Hankyu Karasuma and subway Shijo stations. Like the previous restaurant, this one too is a two star Michelin restaurant. Like always, I’m going to start by telling a bit about the restaurant, this time Wagokoro Izumi. Wagokoro Izumi began operating in 2006, so it’s a rather new kaiseki restaurant in Kyoto. When searching information about the restaurant, I found that the chef of the restaurant, Mr. Izumi, takes great care not only in his cooking, but also in the tableware, the “toko no ma,” an alcove where you have the hanging scroll and flowers, and also in the seasonal decorations at the restaurant like the flowers. After hearing this, I was really looking forward to my visit. So, about the impression the restaurant left on me. First, there were seasonal flowers in front of the restaurant, so it looked very cute. I was impressed by getting to see seasonal things so soon, and entered the restaurant. The restaurant had a relaxed atmosphere. We sat by the counter, but unlike the previous restaurant, here you don’t see the chefs cooking food, but you’re served by women wearing kimono, so it all feels soft and friendly. Once I sat down, I noticed that there were people coming to Japan from overseas also dining in it. The staff could not seem to speak English, but they spoke slowly and used gestures to communicate with these patrons. So it was time to order, and this time we got the \11,000 fixed meal. This was a bit cheaper than last time, but the taste and portion size were both satisfactory! So, like always, here are the three dishes I liked the most! This is the hassun platter, just like last time. Japanese chestnut, Japanese potato known as kinugkatsugi, and fig, are some of the autumn-like ingredients used in this hassun. The decorations on top are Chinese silver grass and Japanese clover, which for the Japanese mean autumn. I felt it was wonderful that they did not only show the season of autumn in the ingredients but also in the decorations. Last we each got our own portions, but this time we got a big plate from where we got to use the bamboo chopsticks to take things to our plates. I was a bit worried about dropping the eggs (it’s quite hard to pick up round things with chopsticks, right?). Next, grilled and salted ayu sweetfish. I ate ayu last time too, but this time I had ayu too, lol! You may have gotten bored of ayu, but this is a different ayu, there is a different niceness to this ayu compared to that of Kikunoi Roan! First, the ayu of Kikunoi Roan came plump with roe, and it was juicily grilled. On the other hand, the ayu of Wagokoro Izumi doesn’t come with roe, and it was grilled to be crunchy and fragrant. When I asked about the way of grilling ayu, they told me they use a special style only employed at this restaurant. The lady serving me told that the texture was almost like they would have been fried and it really did feel like that. How about you, my dear readers, do you like your ayu to be juicy or crunchy? I was so excited when I got to see it: “it looks just like a real chestnut!” I said. The plate reflected light in a beautiful way. By the way, the leaf the kuri kinton is, is a chestnut leaf. I was surprised by how long and narrow chestnut leaves are! It not only looks wonderful, but it’s also delicious! The gentle, simple sweetness of chestnut was soothing. You can feel the season not only in the food! 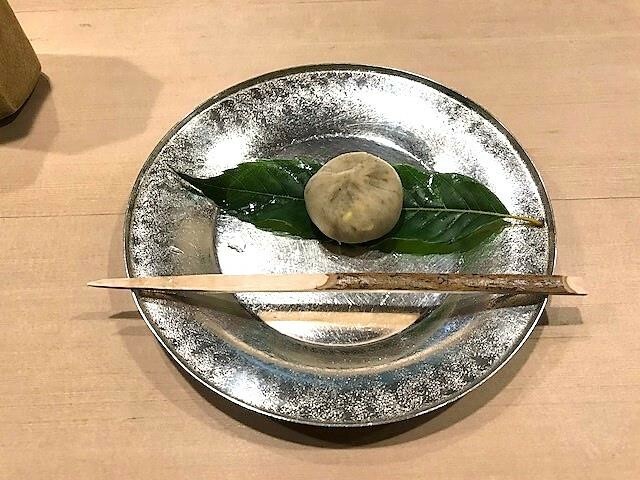 This was my third kaiseki experience, and I noticed that from the first dish, no, from before it, the experience puts the utmost importance on the current season. This time at Wagokoro Izumi I got to see ikebana flowers by the entrance, but there were flowers also at Kyoto Wakuden, and inside Roan Kikunoi there were also flowers. The best seasonal ingredients, and not only the delicious dishes, but also the interior and exterior design of the restaurant, are an important part of the charmingness of kaiseki cuisine. There is one more thing I noticed this time. That is that the tableware is very important. No matter how great the dish, if it and the plate are ill-matched, your impression will be completely different. 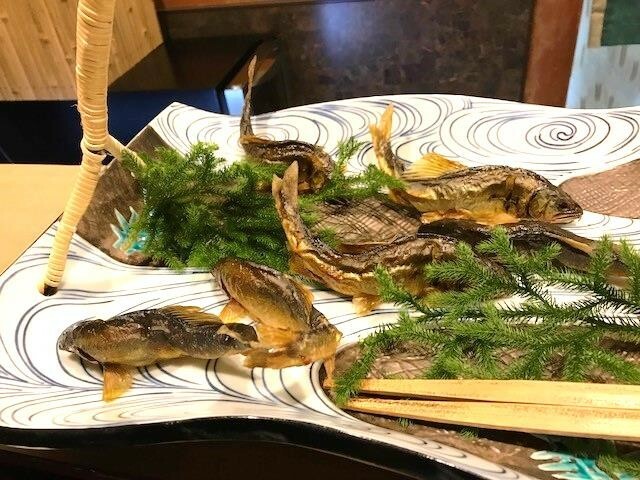 The ayu is a good example, and I’d like you to take a look at that picture again: the plate it’s served on looks almost like a river. Because it’s on a plate like this, the grilled ayu look like they were alive and swimming. In this way, the tableware plays an important role in the enjoyment of kaiseki cuisine, by perfecting the dish. Thank you for reading up to this point! Next, I’m going to Godan Miyazawa! I hope you’ll keep reading about my kaiseki adventures! I used to be really nervous, but now I’m getting used to the atmosphere of kaiseki restaurants, and I feel like I can really concentrate on the taste and the service. I want to tell you even more about the world of kaiseki in the following editions!